Grazing cows during forage collection. Soil sampling in the early spring before planting. Determining soil bulk density after grazing. Flax blooming in the sea of spring planted forage. The growing interest in cover crops and soil health has included only limited discussion of how those techniques can be used in semi-arid climates. In water-limited regions, grazing cover crops may provide an opportunity to improve soil health and most economically use limited water resources. ​Through a multi-state partnership, we are working to identify best management practices for integrating cover crops in dryland cropping systems that balance short-term profitability and long-term soil conservation benefits. Here is a pdf description of the project, goals, and cooperating producers. We are focused on adaptation of conservation practices for the High Plains region that includes a 3-state area of eastern Colorado, western Nebraska, and western Kansas. Our long-term goal is to support producers in the High Plains in the adoption of management strategies that are both profitable, while building soil and ecosystem health. Objective 1: Compare the impacts of replacing fallow with cover or forage crops on subsequent cash crop yields, soil health and water use at KSU and CSU cropping system experimental sites. Objective 2: Through on-farm research, measure the impacts of grazed vs. ungrazed cover crop mixtures on farm economics, soil health, weed dynamics, pollinator diversity and water use. Objective 3: Identify mixtures planted in spring and late summer that balance productivity, forage quality, support pollinator diversity, and limit seed costs. Objective 4: Identify policy and management barriers to the adoption of more intensified rotations in dryland cropping systems including the use of cover crops for grazing and/or haying. ​​The spring cover crop mix was planted in March or April of 2016, and the post-wheat cover crop was planted shortly after wheat harvest in 2017. The spring cover crops were planted mid-March to early April. The field size varied from 43-125 acres. Fields were laid out with 4 large paddocks and 4 ungrazed exclusion areas. Small 15 x 30 ft areas were sprayed out to simulate 'fallow' conditions. ​Cattle were grazed an average of 31 days in 2016 and an average of 28 days in 2017. Each replicate was grazed for about a week. After termination, the spring planted fields were planted with wheat. ​2031 lbs/ac in the ungrazed. Farms varied in what they grazed with and the stocking rates. Some farms grazed yearling steers and other producers used cow/calf pairs or heifers. Cattle stocking rates varied from 196 lbs/ac to 683 lbs/ac. We collected cattle weights individually going onto and coming off of the field, though the grazing period and weighing conditions were not ideal for accurately measuring animal performance. ​With that caveat, typical ADG ranged from 1 lb/day to over 3 lb/day across the two years, likely varying widely due to stocking rate and biomass availability differences. 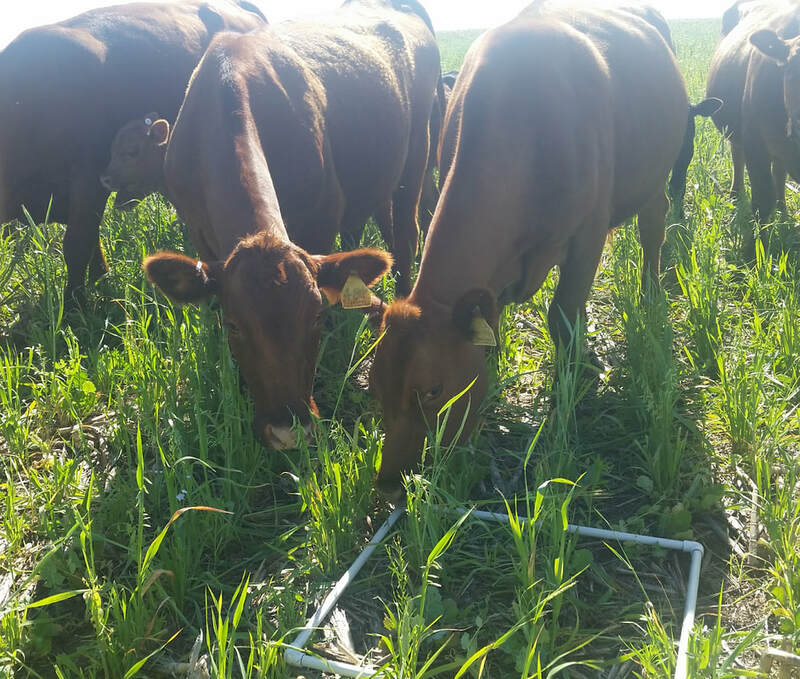 In general, animals gained well on the grazed cover crops, providing producers with an extra source of forage that would have had to been fed out otherwise. ​We compared summer-fallow to grazing or haying cover crops, and growing cover crops solely for cover in the fallow phase of a wheat-sorghum-fallow crop rotation system. All phases of the crop rotation are present in each block in each year of the study starting in spring 2015. Cover crop treatments were chem-fallow, oat/triticale, oat/triticale/peas, spring oat, spring triticale, and a six-way mixture of oat/triticale/pea/buckwheat/radish/turnip. ​Each cover crop treatment was split into two, one-half was harvested for hay and other half left as cover. In addition, a graze and flex treatments of oat/triticale mixture that were grazed, hayed or left as cover were included (above table). The flex treatments were planted only when there was adequate soil moisture at planting and precipitation outlook look favorable, otherwise the plots were left fallow. Infiltration rate is an important soil quality indicator particularly for water-limited environments in the semiarid Great Plains. Soils with greater water infiltration will generate less runoff and store more water from precipitation. Infiltration rates are strongly influenced by land management practices (example tillage, cover crops, crop rotation, residue management etc). The photos above show infiltration measurements in May 2018 (using the Cornell Sprinkle Infiltrometer) on winter wheat plots planted into cover crops terminated in June 2017 at Kansas State University HB Ranch near Brownell, KS. Preliminary results showed average infiltration rates were 1.93 ± 1.1 cm/hr for the fallow treatment compared to 3.11 ± 1.0 cm/hr for grazed oat/triticale mixed, 2.65 ± 0.7 cm/hr for oat/triticale cover and 3.01 ± 0.4 cm/hr for the six specie cocktail mixture (oat/triticale/pea/buckwheat/radish/turnip).